The Swiss Ambassador to China Jean-Jacques de Dardel hosted a dinner reception at the ambassador's residence on November 19, to commend individuals who have made exceptional contributions to the development of China-Switzerland relations, and issued the Certificate of Recognition for Outstanding Contribution to Sino-Swiss Relations. 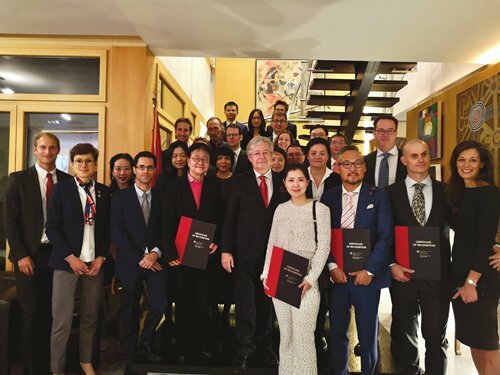 There were 11 new individuals in the political, economic, scientific, cultural and media fields in China and Switzerland that were honored by the embassy, along with five others who had already received the certificate at previous receptions. The Swiss Ambassador to China issued certificates to 10 individuals who participated in the event and offered his appreciation in his opening remarks at the dinner to the receivers for their contributions to the sound development of people-to-people friendship between China and Switzerland.